Location: Fons, in the Meurthe-et-Moselle departement of France (Lorraine Region). 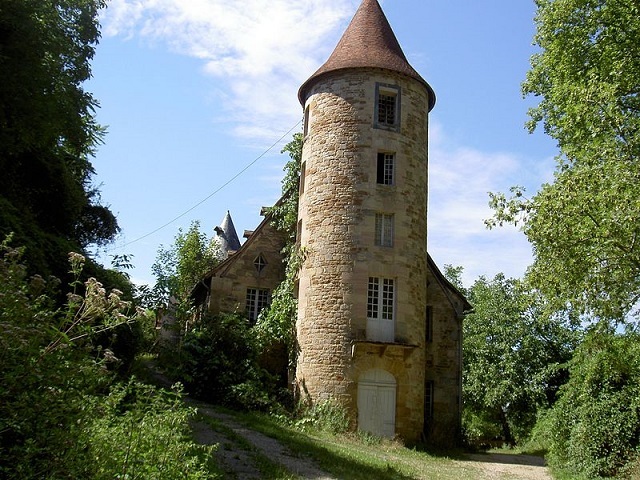 Notes: The castle of Roc is located in the commune of Fons, in the department of Lot.Around 972, an important monastery was founded in Fons. This monastery then became a priory. Under Philip the Fair, in 1302, the territory became royal possession. During the Hundred Years' War Jean de Rudhomme received, in 1384, the office of royal viguier at Figeac. The Prudhomme family received the seigniory of the Roc. The family of Prudhomme was a family of merchants, native of the Rouergue. She settled in Fons in the second half of the fifteenth century, after the Hundred Years War. The construction of the castle began in 1570 by Antoine de Prudhomme. During the wars of religion the Prudhomme remained Catholic. The castle will be encircled by Protestant possessions. The Prudhomme adhered to the League. On March 10, 1622, the Duke of Sully and his son, François de Bethune, the Comte d'Orval, came to put the village seat. Gilbert François de Cardaillac, Lord of Lacapelle-Marival, of Saint-Cernin, of Rudelle, who had taken over the village to the Protestants, left the village to make a reconnaissance. He was taken near the Chateau du Roc. Severely wounded, he was transported to the castle where he died the next day. In 1791, bands from Figeac set fire to the possessions of the Prudhomme at Fons. The burning fire destroyed only one tower. In 1793 the castle is attacked again. The machicolations are dismantled. In 1794, the order was given to trim the remaining two towers. The last Viscount of Prudhomme emigrated as a result of this partial destruction. He returned around 1800 to restore the castle. The castle then passed to his nephew, Colonel Bertrand-Marie-Frédéric de Cornély, who decided to modernize the castle. After destroying farm buildings near the castle, he had the park laid out from 1868. He had a stud farm built with two towers on the other side of the road. He then served as a barn and a stable. The castle was then owned by the Dufau de La Roque until the Second World War. The castle and its outbuildings were listed as historic monuments on 7 December 1993.The castle is a square block of houses with two towers, the roof of which was rebuilt after the Revolution. At the same time was added a body of house in return of square.